Canine bad breath can be a wedge between you and your best pal, but even more important, it can be the first sign of a serious illness in your Weimaraner dog. Just like with people, a clean mouth is important to the health of your dog. If you don’t address your dog’s bad breath and teeth problems, she may develop gingivitis, periodontal disease and painful abscessed teeth. And, in serious cases of gingivitis, your dog’s infected teeth and gums can lead to heart disease. Dog bad breath is not only offensive–it’s often an indication that your dog has a health or mouth problem that needs to be addressed! Unhealthy gums and teeth can cause dog bad breath. Just like his wolf ancestors, your dog has teeth designed for tearing and eating meat. 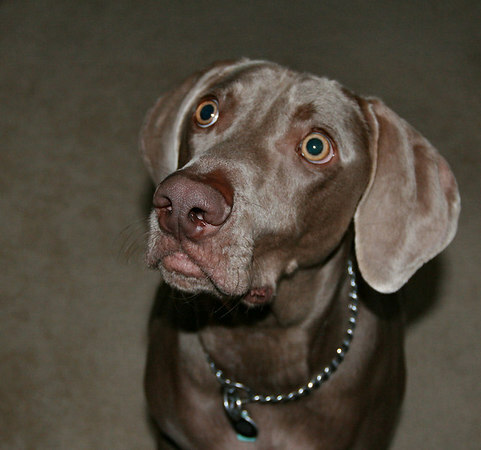 When young, your Weimaraner puppy had 28 baby teeth, that were later replaced by 42 permanent or adult teeth. Your adult Weimaraner dog has 12 incisors in the front and 4 large canine teeth, or eye teeth—designed for grasping and tearing. His rear teeth are molars, and, like yours, they are designed to grind his food. A healthy Weimaraner has pink gums, and her teeth are white, without yellow or brown stains, Her breath won’t smell like a Glad Air Freshener, but she shouldn’t have doggie breath either. Most of the time, stinky dog breath (or canine bad breath), is the result of bacterial growth from food that got stuck in a dog’s teeth. According to the AVMA, or the American Veterinary Medical Association, 80% of dogs are already showing signs of oral disease by the age of three! There are many causes of canine bad breath. If your dog has nasty breath, it’s up to you to find the cause and hopefully rid your pet of bad dog breath. So what can you do to make sure that your dog does not have decayed teeth and dog bad breath? Regular attention to your dog’s mouth will help prevent future health problems. Preventive care involves daily teeth brushing (you can do it), and if absolutely necessary, a once yearly professional teeth cleaning (to be done by your Vet). 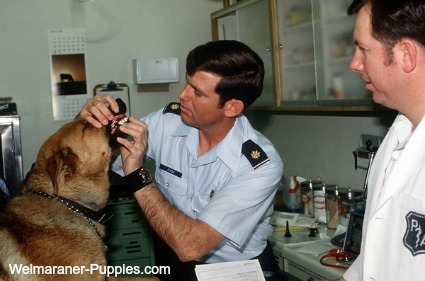 Check your dog’s mouth regularly for any changes and for broken teeth. Brush your dog’s teeth daily – using a specially formulated dog toothpaste. I like to use Petrodex Enzymatic Toothpaste. It’s all natural and has a nice poultry taste that dogs like. This toothpaste has a nice clean, natural smell. A healthy, natural diet is also part of preventive care. Dry dog food (instead of soft food) helps slough off tartar. Canned dog foods are not recommended because soft food produces tartar buildup at a greater rate. Crunchy dog treats with breath control ingredients like mint or charcoal – You can make your own homemade dog treats or purchase special dog treats like these breath freshener treats. If your dog is old, has canine bad breath frequently, or, if you just can’t get it under control, there is still something that you can do. You can freshen your dog’s breath with a canine bad breath mouth spray like Oral Health Mouth Spray . 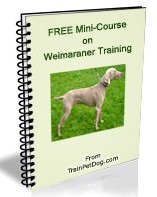 It’s a painless way to handle the problem, and you’ll still be able to be close to your Weimaraner dog or puppy. If your dog has bad breath that doesn’t improve with daily teeth brushing or other obvious treatments over time, you should consider having your veterinarian examine your dog. Your Weinheimer may need a more thorough teeth cleaning (by the Vet), or your dog’s canine bad breath may be a symptom of something more serious.